February 21, 1965, the day Malcolm was assassinated, was a tragic event in African American history as well as a defining moment in the history of black poetry. Among the many responses to Malcolm's death, one of the fairly immediate ones was the formation of the Black Arts Repertory Theater and School in Harlem, where Malcolm was killed. The school, created by several black artists and organizers, had a relatively short period of operation, but it lasted long enough to inspire literary artists to develop the idea of a black arts movement. Larry Neal, one of the leading figures of the movement, was actually in the audience for Malcolm's speech when he was killed. Neal's feelings of helplessness about his inability to protect Malcolm likely fueled his interest to collaborate with other artists to make sure the slain leader's legacy lived on in the formation of a major cultural movement. 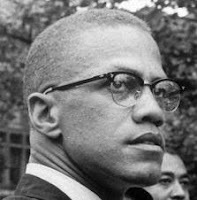 Those who were only slightly familiar with Malcolm's life and views became much more aware of who he was when The Autobiography of Malcolm X was published later in 1965. The Autobiography would become an important point of reference for poets writing about the leader. Later, Neal even wrote a persona poem in the voice of the leader entitled "Malcolm X--An Autobiography," which traces moments in his life. In 1965, Baraka, who was still known as LeRoi Jones at the time, produced an audio recording of his poem "Black Art" on Sonny Murray's jazz album. Baraka was accompanied by Murray on drums, Albert Alyer on tenor saxophone, Don Cherry on trumpet, and Henry Grimes and Lewis Worrell on bass. "Black Art," especially Baraka's reading of the poem, signaled that he was taking on the fiery black nationalist rhetoric and philosophies that Malcolm had embodied. Similar to Malcolm who changed his name from Little to X, large numbers of poets changed their names. LeRoi Jones became Amiri Baraka; Don L. Lee became Haki Madhubuti; Jewell Latimore became Johari Amini; and Val Ferdinand III became Kalamu ya Salaam. In some ways, several black poets perhaps envisioned themselves as little Malcolms. The interests among dozens of black poets of becoming more like Malcolm and their inclinations to celebrate and extend his legacy and ideas in their works helped shape the black arts era and the history of black poetry.